My aunt Jodi told me about dehydrating cherry tomatoes. She let me try some of hers and I LOVED them. When my garden was overrun with tons of pretty little cherry tomatoes, I knew this was what I was going to do with them. This post may contain affiliate links; I’ll earn a small commission if you choose to make a purchase. When you make these yummy, leathery little nuggets of goodness, you can store them in an airtight container until you’re ready to use them. If you want to serve and use them like sun dried tomatoes packed in oil, for safety reasons, it’s best to soak them in oil in the refrigerator just a day or two before you want to use them. Bacteria can form in oil when left at room temperature with the tomatoes in it, so leave them dry until you’re ready to transform them that way. When preparing cherry tomatoes for drying, wash them well and make sure they are completely dry before you begin. 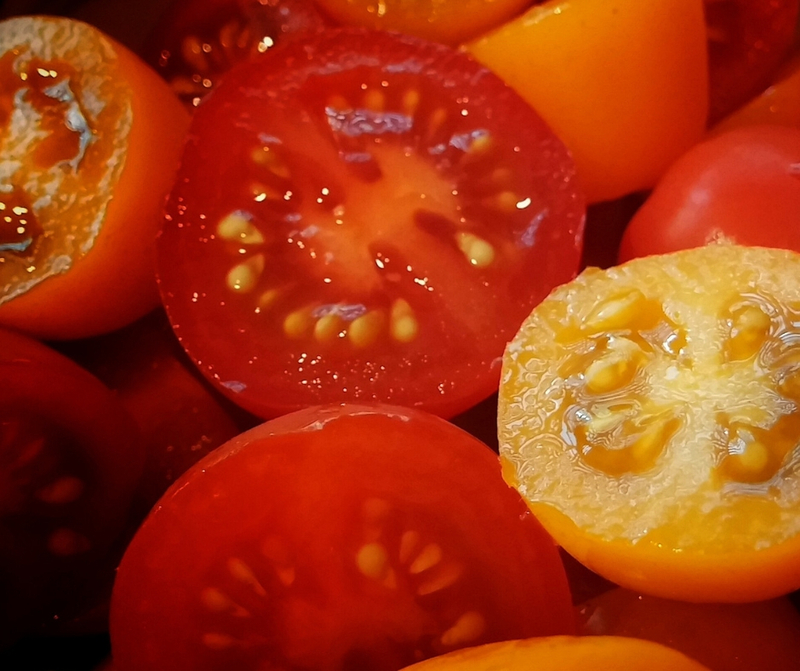 Cut the tomatoes in half and arrange on your dehydrator tray or cookie sheet if you’re going to dry them in the oven, cut side up. Sprinkle them with a little sea salt. You can also sprinkle them with a bit of herbs if you prefer. Basil or tarragon would taste amazing. Place your tomato halves in the oven at 200 degrees and cook them until they are chewy like fruit leather. 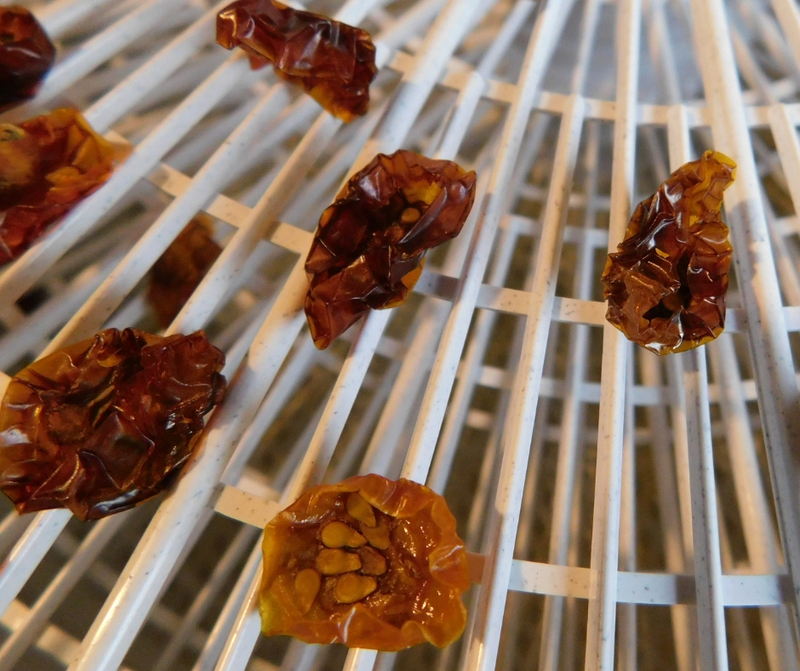 If you’re doing it in a dehydrator, set it on vegetables and follow the same procedure. When you are planning to store dried tomatoes, you need to make sure there is no moisture remaining or they can get moldy in your jars. Try one, they should be chewy like a raisin. These little nuggets of flavor are going to change your life. You can use your dried cherry tomatoes as a salad topping flavor bomb, you can make vinaigrette with them. Add them to sandwiches for a burst of delicious as well. You can also cook dried cherry tomatoes in your recipe to deepen the tomato flavor and add layers of flavors and textures. I hope you try these with your next tomato harvest. There are tons of great recipes you can add these too. They would work for any recipe that calls for sun dried tomatoes too, like this prep ahead frittata, chicken and tomato pasta salad, tomato and ricotta crostini, quinoa salad with spinach, broccoli quiche, or creamy Tuscan chicken pasta. Talk about some yummy dinners!